The top hat was frequently associated with the upper class, and was used by satirists and social critics as a symbol of capitalism or the world of business. The use of the top hat persisted in politics and international diplomacy for many years, including at U.S. presidential inaugurations, the last being worn at the inauguration of John Fitzgerald Kennedy in 1961. The top hat also forms part of the traditional dress of Uncle Sam, a symbol of the United States, generally striped in red, white and blue. The top hat is also associated with stage magic, both in traditional costume and especially the use of hat tricks. Between the latter part of 18th century and the early part of the 19th century, felted beaver fur was slowly replaced by silk "hatter's plush", though the silk topper met with resistance from those who preferred the beaver hat. The 1840s and the 1850s saw it reach its most extreme form, with ever-higher crowns and narrow brims. The stovetop hat was a variety with mostly straight sides, while one with slightly convex sides was called the "chimney pot". The style we presently refer to as the stovepipe was popularized in the United States by Abraham Lincoln during his presidency; though it is postulated that he may never have called it stovetop himself, but merely a silk hat or a plug hat. It is said that Lincoln would keep important letters inside the hat. One of Lincoln's top hats is kept on display at the National Museum of American History in Washington, DC. 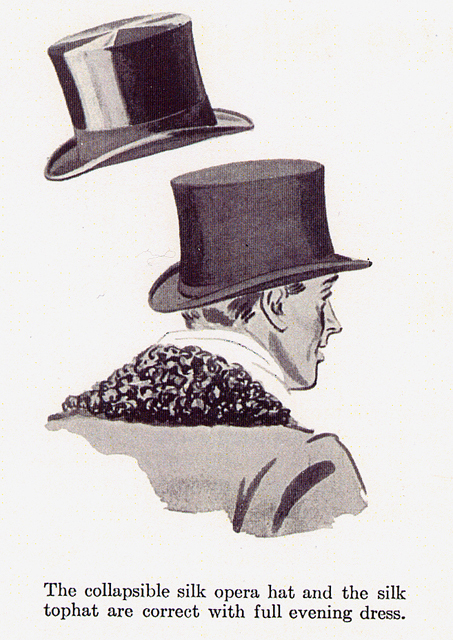 The modern standard top hat is a hard, black silk hat, with fur now often used. The acceptable colors of hats are much as they have traditionally been, with "white" hats (which are actually grey), a daytime racing color, worn at the less formal occasions demanding a top hat, such as Royal Ascot, or with a morning suit. In the U.S. top hats are worn widely in coaching, a driven horse discipline as well as for formal riding to hounds. The British-American musician Slash has sported a top hat since he was in Guns N' Roses, a look that has become iconic for him. Panic! at the Disco's Brendon Urie is also a frequent wearer of top hats. He has been known to wear them in previous live performances on their Nothing Rhymes with Circus tour and in the music videos, "The Ballad of Mona Lisa" and "I Write Sins Not Tragedies". Top hats have also become ubiquitous among the steampunk subculture, often adorned with goggles and feathers. In Freemasonry, as practiced in North American lodges, top hats are often associated with the position of Worshipful Master as he is the only member allowed the privilege of wearing one, or another appropriate head covering to signify his leadership within the lodge. It is also common for a Worshipful Master to receive top-hat-related trinkets and gifts on either the day of his installation or as a going away present. In other countries, especially in certain systems in Germany, top hats are worn by all members of the lodge. Professor Layton of the game series of the same name wears a top hat. His hat also became a logo for the games. Jacob Frye of Assassin's Creed: Syndicate wears a top hat when he is not in stealth mode. The Mountebank, Victor Wolcott of Assassin's Creed 3's multiplayer mode also appears to be wearing a top hat, despite the game taking place during the American Revolutionary War circa 1776. Top hats make several appearances in the multiplayer first-person shooter Team Fortress 2, most commonly the cosmetic item known as "The Ghastly Gibus," but other cosmetics use top hats in their designs as well. Freddy Fazbear of Five Nights at Freddy's also wear top hats, as do his other incarnations. A top hat is available to The Hunter as an attire piece pick up in the game "Bloodborne". Josey, the Funk Zombie from Lollipop Chainsaw wears a top hat adorned with skulls. ↑ Webster's II New College Dictionary. Houghton Mifflin Reference Books. 1995. p. 848. ISBN 0-395-96214-5. ↑ Sewell, Charlotte (1983). Clothes in History. Wayland. Ltd.
↑ Kilgour, Ruth Edwards (1954). A Pageant of Hats Ancient and Modern. ↑ Paterson, Michael; Peter Ackroyd (2007). Voices from Dickens' London. David & Charles. p. 45. ISBN 0-7153-2723-2. ↑ Hoffmann, Frank W.; William G. Bailey (1994-07-07). Fashion & merchandising fads. Haworth Press. p. 260. ISBN 1-56023-031-2. ↑ Benjamin P. Thomas (26 September 2008). Abraham Lincoln: A Biography. SIU Press. pp. 39–. ISBN 978-0-8093-2887-1. ↑ "Abraham Lincoln's top hat". Civilwar.si.edu. Retrieved 2014-03-03. 1 2 ""Gibus" Opera Hat". McCord Museum. Retrieved 2013-07-06. ↑ Cunnington, C Willett and Phyllis (1959). Handbook of English Costume in the Nineteenth Century. Faber. p. 93. ↑ Oxford English Dictionary (1989). 2nd. Ed. ↑ Patents for inventions. Abridgments of specifications. Patent Office. 1874. ↑ de Bono, Edward (1974). Eureka! An illustrated history of inventions from the wheel to the computer: a London Sunday times encyclopedia. London: Holt, Rinehart and Winston. p. 88. ↑ Sichel, Marion (1978). The Regency. London: Batsford. pp. 24–25. ISBN 9780713403428. ↑ Herbert, Luke (1827). The Register of Arts, and Journal of Patent Inventions, Volume 4. p. 64. ↑ "Hat Glossary (G)". Villagehatshop.com. Archived from the original on 2009-12-02. Retrieved 2009-10-25. ↑ "History of Hats". Lock Hatters. Retrieved 2013-07-06. ↑ "Reports of General MacArthur; MacArthur in Japan: The Occupation: Military Phase: Volume 1 Supplement: Chapter 2: Plate 12: MacArthur Takes the Surrender, 2 September 1945". history.army.mil. Retrieved 2014-08-15. ↑ "1 September 2007 - Obituary: Sir Nigel Althaus (the last Government Broker)". The Independent. 2007-09-01. Retrieved 2014-03-03. ↑ Emily Allen (2012-06-05). "5 June 2012: ''Queen returns to Buckingham Palace...''". Daily Mail. Retrieved 2014-03-03. ↑ "The Racing Post - Epsom Derby Dress Code". Derby.racingpost.com. Archived from the original on 2014-03-03. Retrieved 2014-03-03. ↑ "Royal Ascot: ''Racegoers Guide Dress Code ''". Ascot.co.uk. Retrieved 2014-03-03. ↑ Croonborg, Frederick (1907). The Blue Book of Men's Tailoring. New York and Chicago: Croonborg Sartorial Co. ISBN 0-442-21763-3. ↑ Apparel Arts. "Top Hat Etiquette". Archived from the original on 2012-02-27. ↑ "SLASH: 'An Intimate Portrait' Book Due In October". blabbermouth.net. Aug 28, 2012. Over the past twenty-five years, Slash's cool stage presence, gloriously unkempt hair, iconic top hat, and soulful guitar virtuosity has been the epitome of contemporary hard rock. ↑ "masonic-lodge-of-education.com". masonic-lodge-of-education.com. Retrieved 2012-06-06. ↑ Raymond Apple, ''The Great Synagogue: A History of Sydney's Big Shule'', University of New South Wales Press 2008, ISBN 978-086840-927-6 (p.144). Books.google.co.uk. Retrieved 2014-03-03. ↑ "Top hats in shule – Ask the Rabbi". OzTorah. 2013-11-21. Retrieved 2014-03-03.